The giant tortoise, like his namesake, sports a massive size. Some can even reach up to 5 feet in length. With an average lifespan of over 100 years, giant tortoises live out their lives dozing off in the sun for up to 16 hours a day. They will spend the other portions of their lives munching away on grass, leaves and cactus. Some species of giant tortoises are now endangered. Make no mistake about it -- the giant tortoise can live up to his name. Various species of giant tortoises will reach different sizes. In Charles Darwin's first encounter with the Galapagos tortoise, he described it to weigh "at least 200 pounds." 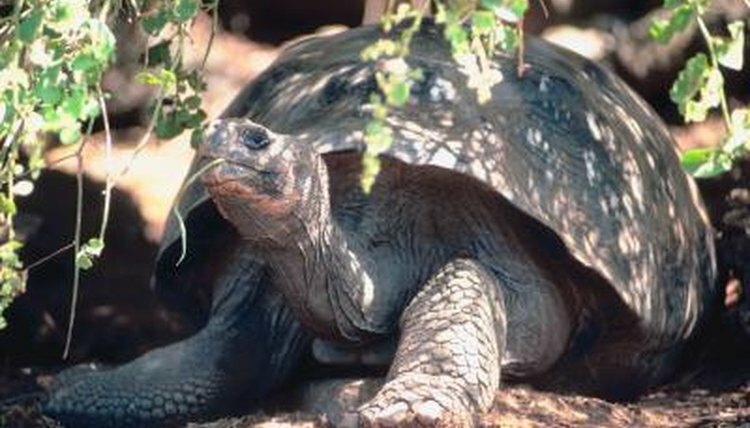 Male Galapagos tortoises can reach up to 573 pounds, although generally they average 475 pounds. Females are usually smaller than males and reach up to 300 pounds. The giant tortoise boasts five front claws and four claws on the back. They help the tortoise navigate through sometimes rugged terrain. When walking, the front limbs and claws usually appear to be turned inward facing one another. Complementing his primarily vegetarian diet, the giant tortoise's jaw is toothless. All tortoises are shielded by the protective covering of their shells. Giant tortoises have either a round, dome-shaped shell or a saddle-back shell. Tortoises with a dome-shaped shell grow to be larger than the saddle-backed variety. Historically, they have always lived on islands with a lot of rainfall where vegetation is plentiful, so this may also explain their larger size. Saddle-backed tortoises developed their saddle-backed shell shape because of a biological adaptation that allowed them to extend their necks further to reach food. They tend to live on islands with less rainfall and dryer climates. A closer look at a giant tortoise will reveal an appearance that is somewhat reminiscent of dinosaurs or crocodiles. Giant tortoises have thick scales all over their limbs, neck and pointed head. Their limbs vary from dark grey to black in color. The thickness of their skin helps protect them from the sun, but their hard shell is still very important for protecting their soft endoskeletons.